Built in 1664, Nymphenburg Palace (Schloss Nymphenburg) was once the summer residence of Bavarian kings. 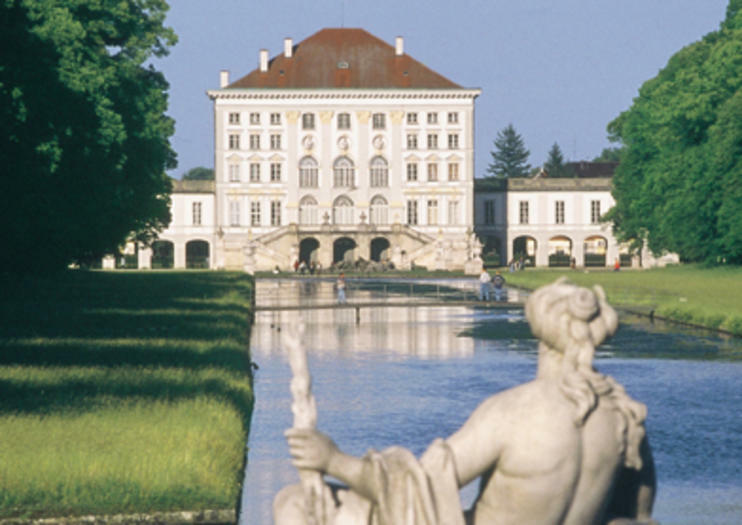 One of the largest royal palaces in Europe and located on the outskirts of Munich, this magnificent complex boasts a dramatic baroque facade, lavishly decorated interiors, and an expanse of stunning gardens and lakes. Visitors can stroll through Nymphenburg Palace at their own pace or take a private tour with an expert guide. Visit on a hop-on hop-off bus tour to see the palace along with other Munich highlights. Inside Nymphenburg you’ll find Elector Max Emanuel’s Great Gallery of Beauties, King Ludwig I's Gallery of Beauties, the Carriage Museum (Marstallmuseum), and the Museum of Nymphenburg Porcelain. Other popular activities include gondola rides on the palace lake and classical music concerts in the Hubertus Hall. Ticket queues can be long during the summer peak season—purchase your tickets online or book a skip-the-line tour instead. There are no official guided tours of the palace, but audio guides are available in eight languages. Free Wi-Fi is available in the palace entrance hall. Most of the palace interiors are accessible for wheelchair users. Full accessibility details are available on the palace website. Allot about two hours to visit the castle, especially if you want to see the gardens. Nymphenburg Palace is located around 6 miles (9 kilometers) northwest of downtown Munich and can be reached by tram from the city (get off at the Schloss Nymphenburg stop). The palace is open year-round, but the busiest months are July and August, when it’s worth booking your tickets in advance. To avoid crowds, arrive just before opening or after 3pm, when most of the day-trippers have already left. The palace chapel and park palaces of Amalienburg, Badenburg, Pagodenburg, and Magdalenenklause are only open April through October. Bavaria is home to dozens of royal castles, but the most famous were built for King Ludwig II, the “Mad King” or “Swan King.” As well as Nymphenburg Palace, where Ludwig II was born, visitors can tour Neuschwanstein, the “Sleeping Beauty Castle;” Hohenschwangau Castle, Ludwig II’s childhood home; the Versailles-inspired Herrenchiemsee Palace; and the king’s masterpiece, Linderhof Castle.